Fresh from his Supreme Court victory, Hobby Lobby President Steve Green has a terrifying plan to Christianize America. And he has enough money to push it through. Fundamentalists who think that they want a return to “old-time religion” should think again. Christians cannot look to the Bible to provide an internally consistent Easter narrative. Middle East Deadlock: Where do you stand? An invitation for readers to speak their minds on the enduring crises of the Middle East. The author of this article charges that recent letters about Israel have crossed the boundary between legitimate criticism and discrimination. Humanistic principles must be applied in understanding and solving the crisis in the Middle East. Expressing opposition to Israeli’s policy’s and actions regarding the Palestinian people does not make one anti-Semitic. Israel may mean well, but it is—unavoidably—built on discriminatory principles that most secularists would abhor in any other context. Nothing in history, international law, or secular humanism requires withholding sovereign nationhood from Israel while allowing it for countries (and would-be countries) that oppose Israel’s existence. Sound science and secularism are firm allies; that’s why the recent merger into CFI Inc. is not only wise but necessary. The recent merger into CFI marks a culmination of two movements’ histories. Charlie Hebdo can be subjected to criticism but should not be blamed for the tragedy that befell it. Condemning the Charlie Hebdo assassins while praising Saudi Arabia’s late King Abdullah makes no sense—they’re on the same side. The massacre at Charlie Hebdo highlights not only the menace of religion but also the shortcomings of liberalism. How might a follower of Jesus write about the events surrounding his death? Be prepared for some surprising revelations. 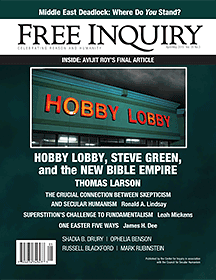 Letters from the April/May 2015 issue of Free Inquiry. As the world groans under the weight of human numbers, the defense of abortion rights matters more than ever. It would be a mistake to consider the works of Sinclair Lewis irrelevant to modern times and freethought’s role. Two subtle lines of evidence appear to verify that the anonymous and anti-monarchical Junius Letters of 1769–1772 were penned by none other than Thomas Paine. Surrounded by sexual abuse, this Primitive Baptist found her church as near to hell as she would ever get. Recent events (including terrorist repression of the author’s new book) provide yet more confirmation of religious faith’s viruslike character. Published before the Islamic attack on the office of Charlie Hebdo, this book takes on even greater relevance in the massacre’s wake. Phil Ryan’s new book, After the New Atheist Debate, is an invitation to move past the vitriol and to open a dialogue between believers and nonbelievers. A poem from the April/May 2015 issue of Free Inquiry.